B-well sent me a bottle of their extra virgin olive oil and canola oil mix to try out. I use olive oil every day for my cooking and canola oil for my mayonnaise and salad dressing. I tried the oil in my mayonnaise but the olive oil taste is far too distinct for my palate. However, I have been using it for my cooking and it is perfect. This therefore is a great addition to my pantry and a product I know I will use more often. Given the high smoke point of the oil it can be used when cooking stir fry’s, and it is healthy to boot. When looking at how good an oil is for you, take a look at the saturated fat value as well as the monounsaturated fat value. B-well oil has a combined value of 64% monounsaturated fats. Given that I was asked to use the oil in a recipe, and that I have wanted to make an olive oil cake for some time, this seemed like the great way to try out the oil. I could not find a recipe in any of my numerous books and so I turned to the web and found Nigella Lawson’s recipe. I could not imagine that her recipe would be anything but perfect and so I set myself the task of baking this cake at the weekend. It was amazing and you would not know that it had used oil instead of butter in the batter. In fact, I might make more cakes with oil in the future. Disclosure: I was sent a bottle of B-well oil to use in a recipe. This post is in line with my blogging policy. 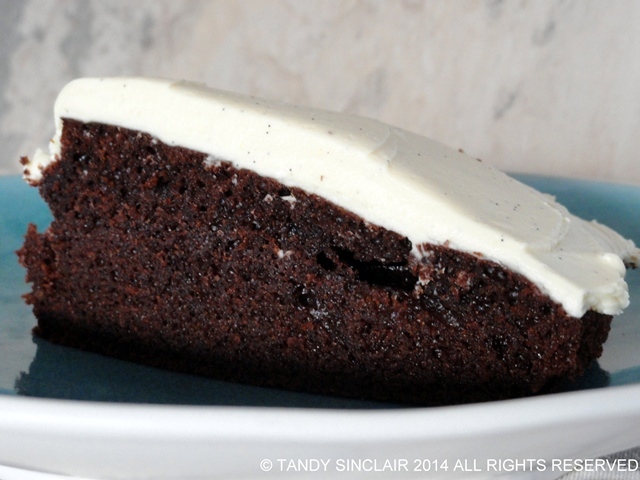 I love olive oil cake but have never put cocoa with it! HI Tandy, love little cakes like this, looks delicious! What kind of olive oil do you use? I tried baking with canola oil, but the taste is not good. Bought some sunflower oil, and then I read the recipe for olive oil. I agree, Tandy! I believe it’s the mono- and poly- unsaturated fats that we need. The cake looks so moist. I think you did great!!! Isn’t it great to have a healthy excuse to enjoy cake? Looks super moist and chocolaty. I could really go for a slice right now, having a weak moment. Sounds intriguing – lovely and moist. Lovely – will have to give your version a try. My “standard” sponge cake recipeis also an olive oil version and you never notice that there’s no butter! Wow, that sounds like something I really should try! my mom actually used half butter and half EVOO for her cake…. Looks like a winner of a recipe Tandy. Hope you and Dave are having a fun holiday. Looks so chocolaty and moist! I love using oil in cakes and this one looks great.